Cam Dobranski began his path to a successful culinary career as a young teenager washing dishes in his uncle’s cafe. Throughout high school, Cam stuck to the kitchen, working in various restaurants and learning the ropes. He discovered a passion for food and cooking that lead him to pursue a full-time culinary career. He attended the Northern Alberta Institute of Technology to study Culinary Arts, and during his studies was asked to join the Culinary Junior Team of Alberta. As part of the team, Cam traveled to Erfurt, Germany to compete in the worldwide Culinary Olympics. From this experience, Cam knew he was destined to travel more and learn about the international food scene. Upon finishing his Culinary Arts diploma, Cam jumped at an opportunity to move to Zurich, Switzerland, and from there he never looked back. While in Zurich, Cam learned to cook under the tutelage of renowned European chefs and developed his own culinary style and flair. When he returned to Canada, he completed a Business Management degree at Grant MacEwan College, before moving to Calgary to start his own businesses. 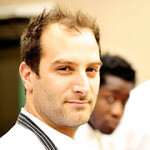 Education and passion allowed Cam to open several restaurants in Calgary, Alberta. He currently owns and operates Winebar Kensington and Brasserie Kensington. As well, Cams’ entrepreneurial spirit spurred two industry related businesses – C2 Distribution, a company importing plateware for local restaurants, and Medium Rare Chef Apparel, a design and manufacturing company inspired by Cam’s vision to create a lifestyle brand’ of clothing that chefs want to wear inside, and outside, their kitchen. Cam’s philosophy in cooking, and in business, is to support his neighbours and the local economy, and to always surround himself with people who share his passion. Although Cam has a fine dining background, since opening his restaurants, he has discovered his niche with a simpler style of cuisine that lets the food speak for itself.